Meat… What does this word means to you? For us it means energy, power and health. Humanity is built on meat, it’s a way of living and reproducing. Strong lives, weak dies, and meat makes you stronger! Up in the mountains, many miles away from urban area, we prepared this caveman style meal… Tender, juicy mangalica fillet on simplest 2 ingredient flatbread, baked directly on coals! Organic to the max! Add handful of fresh rosemary and handful of fresh thyme to the clay pot. Add 3 tbsp. olive oil. Add 1 tsp. smoked paprika. Mix everything well, do not hesitate to use your hands, that’s how you add a part of you and your soul to the dish. Cavemen do everything with their bare hands! Put 2 organic mangalica fillets into the pot. Mix it well! Dip in the marinade. Add some any anti-insect flowers. Leave it in the fridge +50°F(+10°C) to marinate for 3 hours. 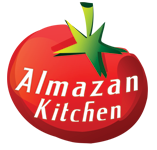 Place the 70g grano duro flour on the cutting board (Do not forget, that Almazan Kitchen produces its own cutting boards and knives, made from elite steel and wood, with all love special for you). Add 1 hand spring water. Mix everything together, then knead until good dough. Cover the dough with your hat for 15 min. While the dough is covered we need to prepare our skewers. If you already have it, good! If not – let’s make one! It’s very easy! Video will help you best CLICK. Add some flour above to prevent from sticking. Stretch the dough from both sides. Bake it on coals +570°F(+300°C) for 30 sec. on each side. Clean the meat from herbs. Put the meat on the skewer and roast on med. heat for 3-5 min. on each side. Cut the meat on the few pieces, and serve it on our bread we made earlier. Oh, you can fill the power inside you, the primal instincts with ancestors spirits rising, now you’re ready to do something great after this juicy food!